In a large pan, season meat with salt and cover with beef stock. Boil until tender, depending on the choice of meat. Meanwhile, boil stockfish with salt and water; add it to the boiled meat. You should have about 700 ml of stock from the meat and stockfish. Reserve the rest or freeze it. In a saucepan, boil the peanuts for about 10 minutes. Leave to cool, then mix in a food processor or blender into a fine consistency. Use water to facilitate the blending. Add to the beef and fish. Mix one onion and garlic cloves into a fine paste and add to the peanuts and meat. Pour in the crayfish and let it simmer for 10 minutes stirring frequently to prevent from getting burnt. Season with salt. Add the bitter leaves or spinach to the pot. Stir and simmer for several minutes. While the pot of ndole is simmering, heat oil in a frying pan or, a cast iron. Add the shrimp, stirring constantly until they turn pink. Slice and add the remaining onions, stir for a few more minutes. 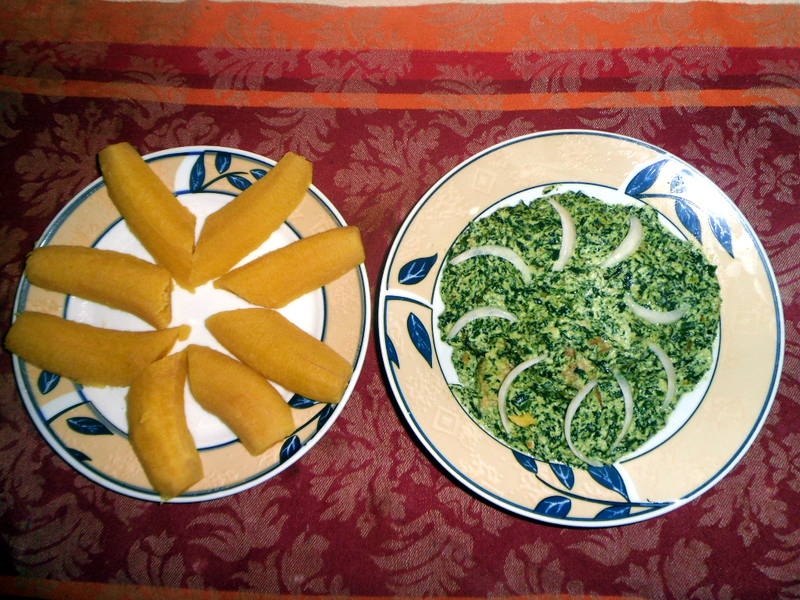 Finally, incorporate the mixture of shrimp, onions and oil into the pot of ndole. Stir for a few minutes and serve hot with fresh or fried plantains. Carole Leuwe lives in Cameroon where she works as an editor in chief at a private radio station in Douala. One of Carole’s favourite hobbies is cooking. She loves to cook for her family and friends, because around a good meal people seem happier. Carole cooks different recipes from all over the world, but says that no one should miss out on the delicious food served in Cameroon. No where in the ingredient list do you have meat. However in the instruction you instruct to cook the meat…What did I miss? Is this a recipe with meat and shrimp or only shrimp? Or is the meat optional? As far as I can see the recipe lists shrimps, stockfish, beef and crayfish among the ingredients so use those. If you can’t see them, can you please send me a screenshot so I can troubleshoot?